**We are extremely excited to announce** that we’ll be a part of the 10 Day #SuperBowlLIVE @mnsuperbowl2018 presented by @Verizon on Nicollet Mall in downtown Minneapolis! The event will be an "epic 10-day fan festival, free and open to the public, leading up to #SuperBowlLII on February 4, 2018.” #BoldNorth . So yes, we’ll be there serving up our famous #glutenfree #minidonuts #chickenbites #hotapplecider for all the locals and out-of-towners! We would ❤ to see you there! . There will be free live concerts, food, and fun! Check the link in our bio for all the details for the event! Verizon is throwing a 10-day festival for fans leading up to the Super Bowl. They’re hosting lots of free events and concerts located downtown along the six blocks of Nicollet Mall, plus food and fun fan activations by brands. And they’re gonna showcase all things “winter” because duh, it’s the #boldnorth. We’re talking guys doing flips on snowmobiles, Ford pickup trucks pulling sleighs, and plenty of snow-inspired activities. Plus lots of food trucks and stands serving Minnesota classics like Juicy Lucy cheeseburgers, stews, Nordic-inspired fare, and hot toddies. Check out the full lineup of performers and attractions to decide whose concert you want to catch and make sure you don’t miss the chance to take your pic inside a life-size snow globe. On the actual day of the game, there’ll be three hours of entertainment from 12 to 3 PM, including DJ Dudley D and 13 Crowns. From January 27th through February 3rd, the Convention Center downtown will play host to what can only be described as an NFL theme park. It’s the perfect place for families with kids who want to “Get Inside the Game” as their tagline suggests. Seriously, several fans have described it as the NFL Disneyland. You can practice real football drills, test out some hi-tech NFL virtual reality, play video games, and see lots of real team gear set up as locker rooms. Plus there will be appearances by NFL players, autograph opportunities, and the real Vince Lombardi Trophy to take a photo with. But be aware: it can get really crowded and there could be lines for lots of stuff. Read more about the Super Bowl Experience and where to buy tickets here. For the Super Bowl fan who’s also a foodie (come on, those exist right? ), the NFL is throwing a huge culinary event on February 3rd, the eve of the big game. Located at the St. Paul RiverCentre, they’re going to set up over 32 food stations – one from each NFL team’s city – where attendees can stroll around trying food and wine pairings from all over the country. The chefs cooking here are all pretty big time. There will also be a silent auction featuring sports memorabilia (and other really expensive things like jewelry), along with a performance by O.A.R. at the end of the night. There’s the potential for mingling with celebrity chefs, like Minnesota local Andrew Zimmern who’ll be hosting the event, and former NFL players, like Ben Leber, the Player’s Host. Tickets are $700 each, but hey, proceeds actually go to a good cause – food banks all over the nation. Read more about Taste of the NFL here. Dave Matthews Band will be playing at the Xcel Energy Center in St. Paul on, you guessed it, the night before the Super Bowl. On February 3rd, everybody’s favorite jam band (in high school, at least) will take the stage. CBS Radio is partnering with On Location Experiences to produce this show. Tickets start at a reasonable $67 so this is actually a doable outing for fans hoping to sneak in a concert while they’re in town instead of an extravagant, over-the-top Super Bowl party. 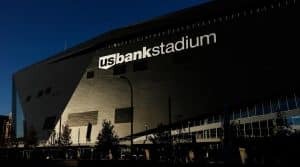 Pre-Super Bowl concerts by Imagine Dragons, Pink, and Jennifer Lopez will take place at the Minneapolis Armory downtown on Thursday, Friday, and Saturday nights leading up to the big game. They’re calling this revamped venue an “intimate” experience, but there’s room for 8,000 fans to get in on the action. Well, at least this is one set of concerts by Nomadic Entertainment that’s going according to plan! On Super Bowl Sunday, NFL On Location is hosting 52 Live at the Armory, but it’s only for holders of the NFL’s Official VIP or Club Level Tickets to the game (they’ll run you anywhere from $6,300 to $13,500). On Location Experiences is curating the event and while they aren’t leaking too many details, we know Kelly Clarkson will be performing and Andrew Zimmern will be overseeing the menu. It really is the perfect place for some pre-game or tailgate action seeing as it’s only a few blocks from US Bank Stadium. Word on the street is there will be lots of NFL alumni and one other big performer appearing. Could it be Sting… and Shaggy? #TBT to the 2017 #PlayersTailgate in Houston, where @guyfieri teamed up with @opbbqrelief to bring the incredible #bbq. And in almost two weeks, they’re back at #SB52 in #Minneapolis to do it again. 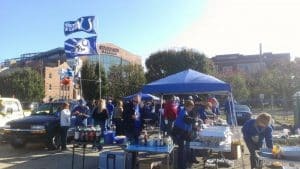 If you’re a big Guy Fieri fan, head over to Flavortown – just kidding, it’s called The Players Tailgate – just a block from the stadium’s security perimeter to party with the man himself. Located in a heated pavilion fitted with comfortable furniture and TVs with ESPN coverage, you can meet NFL players and take advantage of the all-you-can-eat menu. You don’t have to have a Super Bowl ticket to attend, but you do have to have to throw down $750 to “tailgate” here. Previously hosted by the likes of Erin Andrews and Michael Strahan, this year’s emcee will be Charissa Thompson, who you may have seen on Fox Sports and ESPN. And DJ Irie will be playing some jams while you stuff your face with Korean fried chicken, poke and sushi, prime rib sandwiches, a full raw bar of oysters, crab legs, and caviar, and barbecue… everything. No, seriously. You can check out the menu and purchase tickets here. So you’re fancy enough to even wonder what goes on in those stadium clubs before kickoff? Well, while we aren’t totally sure either, but there will be NFL On Location events taking place in the Delta Sky360 Club as well as the Buffalo Wild Wings Club in US Bank Stadium this year. Kelly Clarkson will be performing at the Delta Sky360 Club for Platinum and Platinum Plus ticket-holders before popping over to the Armory. And NFL players Derrick Brooks and Hines Ward will be hanging out there too. Honestly, who knows what’s going on in the Buffalo Wild Wings Club for the Gold and Gold Plus fans, but Marcus Allen, Tim Brown, Steve Largent, and Dermontti Dawson are slated to attend. The only other thing we know for certain is that there will be pre-game entertainment and “premium tailgate food and beverages.” Check out the NFL’s brochure and pricing here. After the Super Bowl Experience clears out, the NFL is setting up its Official 2018 Tailgate Party downtown at the Minneapolis Convention Center. On February 4th, from noon until 4 PM, you can snag tickets to eat, drink, and rub elbows with NFL legends. Take pics, get autographs, and bring the whole family to this one. It’s kid-friendly. There will be premium food stations, an open bar, and pre-game entertainment to get you pumped for the big game. Plus it’s still within walking distance of US Bank Stadium. You’ve gotta have a ticket to the Super Bowl to attend, but it is the official tailgate of the NFL after all. Buy your tickets here.